An interesting read giving some insight into the backround of the making of the WI 'Alternative' calendar and later the film Calendar Girls. In which a Lady of Rylstone reveals all. 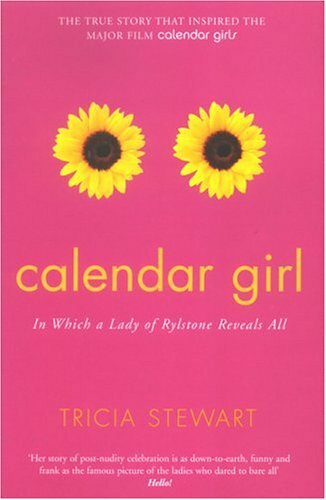 In Calendar Girl Tricia Stewart shares her experiences of the many funny moments and the sad, about the highs and occasional lows of fame. She describes how the calendar transformed her life and writes with warmth and humour about the remarkable women who - to their surprise - became an international sensation. It was good to read the truth about the making of the calendar and film which I had only previously read about in the press. It was a tremendous achievement eventually raising so much money for the charities but the book also tells of the effect it had on the lives of all the women. I am now going to offer this as a bookring. I hope you have fun with this book! This is the list so far but the order may change. hi thanks the book arrived whilst I was away last week. Very tempting to dive straight in but I really am too tired tonight. An easy an interesting read. I really enjoyed the book my only complaint would be that it occasionally turned into a list of the events they had attended which was a bit boring but all in all I enjoyed it.